Vail 21 Condos are ideally located in the Lionshead section of Vail Village, just steps from the ski lifts and restaurants with easy access to the free in town shuttle. 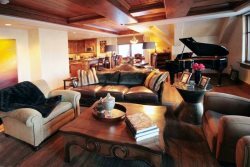 With activities like ice skating right outside your door you can't go wrong in these Vail Lionshead condominiums. Convenience and location are yours for less than the cost of a pricey hotel room. Affordable rates on these silver rated condos include assigned underground parking. Vail 21 condominiums include rooftop hot tub, laundry room, redwood sauna, wood burning fireplace, and a full kitchen in the unit.